The Catalyst Fund, powered by the Howard County Economic Development Authority (HCEDA), is part of Maryland’s Video Lottery Terminal Small, Minority and Woman-Owned Business Account initiative. The fund is a locally managed source of capital used to finance start-ups and expanding businesses statewide whose projects will create permanent jobs and leverage private sector investment. 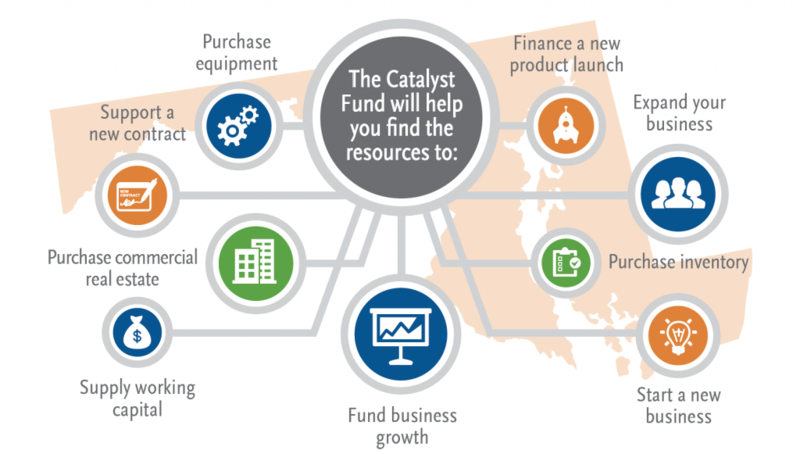 Catalyst is a Revolving Loan Fund (RLF) – as borrowers repay Catalyst Fund loans, the principal and interest payments are returned to the fund for lending to other businesses to create more jobs and investment opportunities. What can I used the fund for? Loan funds can be used for normal business uses such as working capital, equipment, real estate, franchise fees and inventory purchases. Loan amounts are always subject to availability of funds. I’m Interested. How Do I Proceed? Step 1: All potential candidates must complete an Application Form, which requires a nonrefundable application fee and in-depth information. For more information, contact the Catalyst Fund Manager via email or by phone at 410.313.6550.